The effect of invasive species on native species can be profound, yet very little is known about the complex interaction between the invaders and the native species, or, perhaps more importantly, between multiple invaders and native species. In a research paper “Complex replacement of invasive congeners may relax impact on native species: interactions among zebra, quagga, and native unionid mussels,” lead author Lyubov E. Burlakova, research scientist with the Great Lakes Center discusses the importance of understanding those interactions. The study was published online in PLOS ONE on December 9, 2014. The study, which was funded by the U.S. 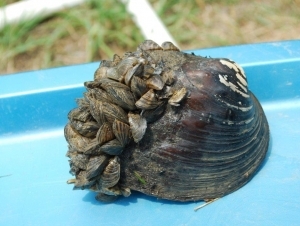 Fish and Wildlife Service via the Great Lakes Fish and Wildlife Restoration Act, focused on the impact of the invasion of Dreissena polymorpha, the zebra mussel, and Dreissena rostriformis bugensis, the quagga mussel, on native mussels. Both zebra and quagga mussels invaded the Great Lakes at the same time. "Our findings strongly suggest that that the effect of different species is much stronger than the effect of time since the invasion on the level of unionid infestation," said Burlakova. The freshwater bivalves of the family Unionidae—the family to which native mussels belong in the bodies of water studied—declined sharply after the Dreissena invasion. This effect was first detected in the late 1980s. Although there had been a strong decline in diversity and abundance of unionids before the Dreissena invasion due to habitat destruction and deterioration of water quality, the appearance of Dreissena accelerated that decline dramatically. For example, the number of native unionid species dropped from 18 to 5 in Lake St. Clair after zebra mussel invasion. To evaluate the effect of both dreissenid species on unionids in the lower Great Lakes region after 25 years of invasion, researchers analyzed data on more than 4,000 unionids from 26 species that were collected at multiple sites in lakes Erie, Ontario and St. Clair, the Detroit River, and inland lakes in Michigan in 2011–2012. Infestation was measured by examining unionids to see if either zebra or quagga mussels were attached to them or had been attached previously. The presence of connecting threads—protein threads called byssal threads— indicated earlier infestation. The most important finding was that despite the many similarities between Dreissena species, quagga mussels infested unionids less severely than zebra mussels. Therefore ongoing replacement of zebra with quagga mussels in the Great Lakes Region relaxes Dreissena impact on native unionids. Infestation, or the number of dreissenids attached to native unionids, had declined by 2011–2012 in lakes dominated by quagga mussels to almost one-tenth of the numbers found in the 1990s. In contrast, unionids are still heavily infested in waterbodies dominated by zebra mussels. The research study considered both life history and ecological traits of unionid species, and found no significant difference in infestation among them. This suggests that susceptibility to infestation among native mussels was not a significant predictor of the impact of a Dreissena invasion. Instead, the study suggests that biological differences between these two notorious closely related invasive species that are generally perceived as minor, such as the synthesis rate and attachment strength of the threads used by Dreissena to attach themselves to native unionids, can drive profound differences in environmental impacts on native communities they invade.